It’s so much more than a license plate. 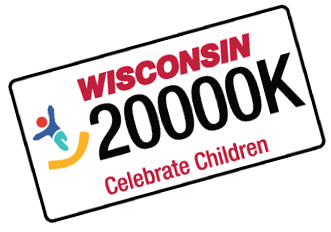 By purchasing the Celebrate Children license plate, you can strengthen Wisconsin families and help make sure all our kids grow up safe and nurtured. Each plate purchase and renewal includes a $25 tax-deductible contribution to the Celebrate Children Foundation. The Foundation supports the Child Abuse and Neglect Prevention Board work to increase access to education, programs and services for families and children in communities across the state. Complete the Celebrate Children License Plate Application Form. Calculate fees as described on the application form. If the vehicle you want to register with these plates is NOT titled (registered) in your name, follow the instructions on the Application Form. 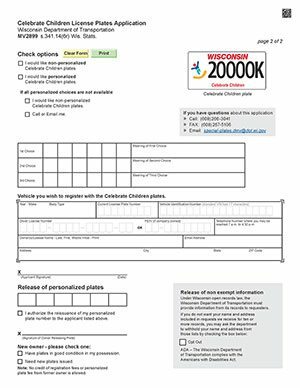 If you currently have Celebrate Children license plates and want to replace them with the newly designed plates, complete and mail the Replacement License Plate Application Form. Questions: Call the WisDOT Special Plates Unit at (608) 266-3041.